Many People Can Delay Treatment For Thyroid Cancer : Shots - Health News After five years, just 12 percent of people diagnosed with papillary thyroid cancer saw their tumors grow by 3 millimeters or more, a study found. And in some people, the tumors shrank. So Terry DeBonis' approach to treating her thyroid cancer might seem surprising. Although she was diagnosed with cancer four years ago, she still hasn't begun treatment. "There are risks and complications with every surgery," says DeBonis, a nurse in Glen Rock, N.J. "I didn't want to put myself through that." About one-third of patients with a slow-growing type of thyroid tumor, called papillary thyroid cancer, are eligible to delay treatment, says Dr. R. Michael Tuttle, an endocrinologist at New York's Memorial Sloan Kettering Cancer Center and lead author of a study published Thursday in JAMA Otolaryngology-Head & Neck Surgery. In Tuttle's study, 291 patients whose tumors were considered low risk opted for a watch-and-wait approach. Doctors recommended that anyone whose tumors grew more than 3 millimeters ­— about the smallest change visible on an ultrasound ­— consider surgery. Dr. R. Michael Tuttle, an endocrinologist at New York's Memorial Sloan Kettering Cancer Center, talks with Debonis about an ultrasound of the thyroid tumor. After two years, only 2.5 percent of patients' tumors grew that much. By five years, 12 percent of patients' tumors had increased at least 3 millimeters, according to the study. Importantly, none of the tumors spread outside the thyroid, a development that signals a more aggressive cancer. And to the researchers' surprise, 19 patients saw their tumors shrink by at least half, the study said. "I would not have guessed that would happen in a million years," Tuttle says. In the end, only 10 patients opted to have surgery, according to the study. Older patients were the least likely to see their tumors grow, Tuttle says. 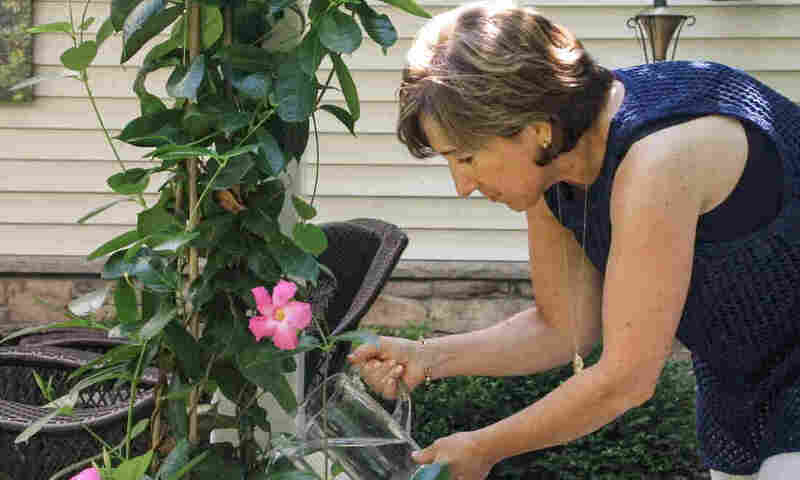 Patients in their 20s and 30s have a 10 to 15 percent chance that their tumors will grow within two years, while people over age 60 have a 1 to 2 percent risk, he says. Cancer is primarily a disease of aging. Many thyroid tumors today are found when they're too small to be felt or cause symptoms. Instead, doctors find these tiny cancers accidentally, while performing a CT scan or ultrasound for some other reason. DeBonis says her cancer was found when her endocrinologist, who has treated her for an underactive thyroid for many years, decided to perform an ultrasound. A biopsy, in which doctors remove a small sample of tissue, found cancer. The incidence of thyroid cancer nearly tripled from 1975 to 2009, according to a 2014 study, with almost all of this increase coming from papillary thyroid cancer, the slowest-growing type. Yet mortality from thyroid cancer hasn't changed. That suggests that doctors are detecting many harmless cancers, Dr. Joseph Scharpf, an otolaryngologist at the Cleveland Clinic Foundation, noted in an editorial accompanying the study. Autopsy studies suggest that about 10 percent of Americans have an undiagnosed thyroid cancer, most of which never cause harm, Tuttle says. According to the American Cancer Society, an estimated 56,870 new cases of thyroid cancer will be diagnosed this year, and 2,010 Americans will die from it. About 3 in 4 thyroid cancer cases are in women. "We've been treating things that I don't think needed to be treated," Tuttle says. In May, the U.S. Preventive Services Task Force recommended that people not be routinely screened for thyroid cancer, because that increases the risk that they will undergo treatment for tumors that would never cause problems. Removing the thyroid leaves patients dependent on thyroid replacement hormones for the rest of their lives. Many of these patients complain of weight gain and fatigue, saying they just don't feel like themselves, Tuttle says. Five years ago, based on encouraging research from Japan, Memorial Sloan Kettering decided it was safe to allow some patients with low-risk tumors to delay surgery, Tuttle said. Doctors still recommend immediate surgery for patients whose tumors are larger, more aggressive or which have spread outside the thyroid gland. Until now, however, most U.S. doctors did not know if watching and waiting would be safe, Tuttle says. Most of the patients in the new study shouldn't have even had a biopsy, Scharpf wrote. That's because the American Thyroid Association recommends against performing needle biopsies on thyroid tumors under 10 millimeters. Some patients say they still want their doctors to treat their thyroids more aggressively. "I hate the waiting," Brown says.